Palestinian suffering from mental disorder was killed at the western entrance to Silwad village, northeast of Ramallah. 2 Palestinian civilians were wounded in al-Dheisha refugee camp, south of Bethlehem. Israeli forces conducted 43 incursions into Palestinian communities in the West Bank and a limited one in the central Gaza Strip. 41 civilians, including 10 children, a mother and her daughter, were arrested. 10 of them, including 5 children, were arrested in occupied Jerusalem. A house belonging to Amayrah family in Doura, south of the West Bank, was bombed. 6 dwellings and 2 livestock barns in al-Ma’azai community, east of Jaba’ village, north of Jerusalem, were demolished. 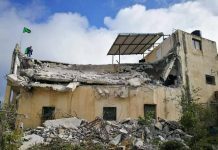 A house in Sour Baher village and 2 other under-construction houses in Silwan village, south of the city, were demolished. A Palestinian fisherman was wounded, 5 others were arrested, 2 fishing boats were confiscated and a third was damaged. 8 Palestinian civilians, including a woman, were arrested at military checkpoints. Israeli violations of international law and international humanitarian law in theoPt continued during the reporting period (25 – 31 August 2016). Israeli forces have continued to commit crimes, inflicting civilian casualties. They have also continued to use excessive force against Palestinian civilians participating in peaceful protests in the West Bank and Gaza Strip, the majority of whom were youngsters. During the reporting period, Israeli forces killed a Palestinian civilian suffering from a mental disorder and wounded 3 others, 2 of them in the West Bank and the 3rd in the Gaza Strip. In the Gaza Strip, Israeli forces continued to target Palestinian fishermen and chase them in the sea. In the West Bank, on 26 August 2016, in excessive use of lethal force, Israeli forces killed Eyad Hamed (38), who suffers from a mental disorder, at the western entrance to Silwad village, northeast of Ramallah. Israeli media reported that Israeli forces opened fire at a Palestinian who ran towards them and refused to stop when he was asked to, therefore, they suspected him and opened fire at him. On the same day, 2 Palestinian civilians sustained bullet wounds to the lower limbs when Israeli forces moved into al-Dheisha refugee camp, south of Bethlehem, to carry out arrests, during which dozens of youngsters gathered and threw stones and Molotov Cocktails at Israeli soldiers. Therefore, Israeli soldiers opened fire in response, due to which 2 Palestinian civilians were wounded and then taken to hospitals by private cars because ambulances were banned by Israeli forces from reaching the wounded. In the Gaza Strip, in the context of targeting Palestinian fishermen in the sea, on 25 August 2016, Israeli gunboats stationed off the northwest of Beit Lahia, north of the Gaza Strip, opened fire heavily towards the Palestinian fishing boats. Two Israeli gunboats surrounded a fishing boat on board of which were Abdul Aziz Sa’dallah (24) and Mohammed Sa’dallah (68), both from Jabalia refugee camp. As a result, the first fisherman was wounded and arrested while the fishing boat was hit with several bullets. On 27 August 2016, Israeli gunboats opened fire also in the same area. As a result, Abdul Latif Troush (21) and Ahmed Abu Hassan (22), both from al-Twam area in Jabalia, were arrested and then transported to Ashdod Seaport, while their fishing boat and 10 pieces of fishing net were confiscated. On the same day afternoon, Israeli forces released the 2 fishermen but kept the boat in custody. On 28 and 29 August 2016, similar attacks were carried out by Israeli forces in the same area. On the second day, fisherman Mahdi Abu Reyala (38) and his son Nafez (16), from the Shati’ refugee camp, west of Gaza City, were arrested and the fishing boats was confiscated. During the reporting period, Israeli forces conducted at least 43 military incursions into Palestinian communities in the West Bank and 4 ones in occupied East Jerusalem and its suburbs. During these incursions, Israeli forces arrested at least 41 Palestinian civilians, including 10 children, a mother and her daughter. Ten of them, including 5 children, were arrested in occupied Jerusalem. In the Gaza Strip, on 31 August 2016, Israeli forces moved about 100 meters into the east of al-Bureij refugee camp, in the central Gaza Strip. They levelled lands along the border fence and withdrew later. On 30 August 2016, Israeli forces moved into Soud valley, north of Doura, southwest of Hebron and stationed in the vicinity of a house belonging to the family of Mohammed Amayrah (38). They raided the house in which Mohammed’s family consisting of his wife and their 2 girls live and started planting explosives in the walls. Israeli forces asked all neighbours around to get away and kept them in one house before bombing Mohammed’s house. It should be noted that Mohammed is being arrested by Israeli forces since 02 July 2016 under the pretext that he was involved in a shooting against a settler vehicle on road (60) that resulted then in the killing of a female settler. Concerning house demolitions and demolition notices, on 29 August 2016, Israeli bulldozers demolished 6 dwellings and 2 livestock barns in al-Ma’azi community, east of Jaba’ village, north of occupied Jerusalem. As a result, 28 individuals, including 18 children, were rendered homeless. On 30 August 2016, Israeli bulldozers demolished a house in Sour Baher village, south of Jerusalem, belonging to the family of Wasim Atiyah under the pretext of building without a license. Atiyah mentioned that he tried to obtain a license for the house and the municipality court had appointed the end of October for a hearing to discuss the house license issue. In the same context, Israeli bulldozers demolished 2 under-construction houses in Yasoul valley in silwan village, south of the Old City of Jerusalem, belonging to Eyad Nairoukh. It should be noted that Nairoukh started building the 2 houses on 11 August 2016 and he was shocked by the demolition. In addition, Israeli forces demolished 2 fences around the 2 houses as well. 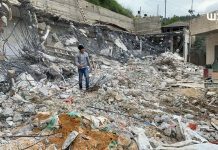 Nairoukh said that Israeli forces demolished 2 under-construction apartments he started building 2 weeks ago. At approximately 02:00, Israeli forces moved into Selwad village, northeast of Ramallah. They raided and searched houses from which they arrested Ibrahim Dawoud Hamad (20), Saif Salah Hamed (20), Handalah Samir Hamad (20), Mohamed Khalid Hamad (20), Mohamed Abdullah Hamed (23) and Abed al-‘Aziz Lutfi Hamad (23). Around the same time, Israeli forces moved into al-Am’ari refugee camp in al-Bireh city. They raided and searched a house belonging to Mohamed Ameen Abu Radaha and arrested him. At approximately 03:00, Israeli forces moved into Bethlehem and stationed in al-Fawaghrah area in the centre of the village. They raided and searched houses from which they arrested ‘Alaa Jala Shalash (31) and Mahmoud Esam Jabir (24). At approximately 06:00, Israeli gunboats stationed offshore, northwest of Beit Lahia, north of the Gaza Strip, opened fire at Palestinian fishing boats sailing within one nautical mile. Two Israeli gunboats approached a fishing boat belonging to Abed al-‘Aziz Fareed Abdullah Sa’dallah (24), which was manned by the fishing boat owner and Mohamed Mohamed Mousa Sa’dallah (68). Both of the abovementioned fishermen are from Jabalia refugee camp. Israeli navy forces obliged Mohamed Sa’dallah to lay down over the boat, while they forced Abed al-‘Aziz to take off his clothes, jump into the sea and swim towards the gunboats. After that, Israeli navy forces left Mohamed Sa’dallah on the fishing boat and took Abed al-‘Aziz to an unknown destination. Another Palestinian fishing boat headed towards S’adallah’s boat and pulled it to the shore, during which they noticed that the fishing boat engine was damaged due to the Israeli shooting. Moreover, the fishing boat was hit with live bullets, while one of the fishermen was wounded. The fisherman Mohamed S’adallah said that at approximately 05:00 on Thursday, he headed to the sea along with his nephew, Ahmed S’adallah (26), to gather the fishing nets. After that, another fisherman, Abed al-‘Aziz who was present there, pulled ‘Sadallah’s fishing boat and then stationed near the fishing nets they threw in the sea a day before. They were sailing within one nautical mile off al-Wahah resort. They were then surprised that 15 fishing nets were damaged by Israeli navy forces. Mohamed S’adallah collected the remaining fishing nets. At approximately 06:00 on the same day, Mohamed was surprised that two Israeli gunboats headed towards him and heavily opened fire around the fishing boat, so they fled eastwards. After that, they were forced to stop sailing due to the heavy shooting. When Israeli gunboats approached the fishing boat, Israeli navy forces directly opened fire at the boat resulting in damaging the engine. Israeli navy forces then obliged Mohamed to lay down over the boat, while forced Abed al-‘Aziz to take off his clothes, jump into the sea and then swim towards the gunboat. As a result, Abed al-‘Aziz sustained wounds to his left leg while swimming and was then taken to an unknown destination. At approximately 18:30, Israeli forces moved into ‘Oreef village, south of Nablus. They raided and searched a house belonging to Ziyad Ahmed Shehada (20) and arrested him. Note: During the aforementioned day, Israeli forces conducted (5) incursions in the following areas and no arrests were reported: Dura, Deir Samet, al-Koum, Deir Razah and Tafouh villages in Hebron. At approximately 02:30, Israeli forces accompanied with over 10 military vehicles moved into al-Dahisha refugee camp, south of Bethlehem. They raided and searched a house belonging to Omar Mohamed al-Sayfi claiming that they are looking for his son Naba’ (19), who was not home. An Israeli officer asked the family to call Naba’ and tell him to surrender, but his family refused. As a result, Israeli forces arrested all the family members, who were identified as Naba’s father, Omer, and his mother, Nawal Mohamed Dawoud, his brother Mo’az and his sister Asmaa. After that, Israeli forces took the arrested persons to Anton Mount overlooking the camp in order to oblige Naba’ to surrender. In the meantime, dozens of Palestinian young men gathered and threw stones and Molotov cocktails and handmade explosive devices. Israeli forces then fired tear gas canisters, sound bombs and flare bombs at them. As a result, 2 civilians were hit with live bullets to the lower limbs and were then taken by a private car to a hospital. It should be noted that Israeli forces denied ambulance crews access to the camp. Around the same time, Israeli forces moved into al-‘Aroub refugee camp, north of Hebron, and stationed in the center of the camp. They raided and searched two houses from which they arrested Khalil ‘Izaat Banat (22) and Salah ‘Anan al-Landawi (19). In excessive use of lethal force, Israeli forces killed a Palestinian civilian from Selwad village, northeast of Ramallah, at the western entrance to the village. According to PCHR’s investigations and statements of eyewitnesses, Eyad Zakaria Mohamed Hamed (38), who suffers from mental disability, headed to the western entrance to Selwad village, northeast of Ramallah. Eyad approached a military watchtower established there and entered into an area surrounded by barbed wire. At approximately 12:35, Eyad tried to get out of the area, but he could not identify from where he entered, so he ran. As a result, Israeli soldiers opened fire at him and wounded him to the back. Eyad fell near the cement cubes at the entrance. A PRCS ambulance arrived at the area, but Israeli forces denied them access to the wounded. After that, an Israeli military ambulance arrived and put Eyad in a black bag, which means that he was dead. They then took Eyad’s corpse to “Ofer” settlement. In the evening, Eyad’s family received their son corpse and then took it to Palestine Medical Complex, where medical sources stated that Eyad was hit with a live bullet that entered his back and exited the upper side of his chest. Eyad’s corpse was directly taken from Palestine Medical Complex to Selwad village for funeral procession. It should be noted that the victim was married and has two children. The Israeli media reported that Israeli forces opened fire at the Palestinian civilian after he ran towards them and refused to stop, so they suspected him and opened fire at him. Note: During the aforementioned day, Israeli forces conducted (3) incursions in the following areas and no arrests were reported: Sureef, Beit ‘Awaa and Samou’a villages in Hebron. At approximately 01:30, Israeli forces moved into Bita village, southeast of Nablus. They raided a sport club in the center of the village and confiscated surveillance cameras. After that, they withdrew and no arrests were reported. At approximately 02:30, Israeli forces moved into Dura, southwest of Hebron, and stationed in Haninah area. They raided and searched a house belonging to Ahmed Raied Shanan (17) and arrested him. Around the same time, Israeli forces moved into Rojeeb housing compound and the outskirts of Balata camp from the eastern side, southeast of Nablus. Israeli forces raided houses, during which, a number of Palestinian young men gathered and threw stones at Israeli soldiers, who fired tear gas canisters in response. Moreover, Israeli forces chased ‘Isaa Ribhi Hashash (17) and arrested him. At approximately 07:45, Israeli gunboats stationed offshore, northwest of Beit Lahia, north of the Gaza Strip, opened fire at Palestinian fishing boats sailing within 2 nautical miles. An Israeli gunboat approached a fishing boat belonging to Talal Zaki Taroush (30), which was manned by Abed al-Latif Zaki Mostafa Taroush (21) and Ahmed Waheed Hussain Abu Hasan (22). Both of the above-mentioned fishermen are from al-Towam area in Jabalia refugee camp. Israeli navy forces then obliged the fishermen to take off their clothes, jump into the sea and swim towards the gunboat. The fishermen were arrested and taken to Ashdod Seaport, while the fishing boat was confiscated and 10 fishing nets as well. At approximately 13:00, Israeli forces released the two fishermen via Beit Hanoun “Erez” crossing, while the fishing boat is still in custody. Note: During the aforementioned day, Israeli forces conducted (4) incursions in the following areas and no arrests were reported: Bani Na’iem, al-Dahiriya and Suraa villages in Hebron; and Beit Fowreek village, northeast of Nablus. At approximately 02:00, Israeli forces moved into ‘Aida refugee camp, north of Bethlehem. They raided and searched a house belonging to Mowafaq Badawnah and arrested his son, Abed al-Raziq (25). At approximately 03:00, Israeli forces moved into al-Khadir village, south of Bethlehem. They raided and searched a house belonging to ‘Anan Suliman Salah (37) and arrested him. At approximately 08:00, Israeli gunboats stationed offshore, northwest of Beit Lahia, north of the Gaza Strip, opened fire at Palestinian fishing boats sailing within 2 nautical miles. As a result, fishermen were forced to flee for fear of being arrested or wounded and no casualties were reported. At approximately 19:00, Israeli forces moved into Burin village, south of Nablus, and stationed in front of the Civil Defence Office. Israeli forces arrested Ali Qadafi Hindy (15), while passing in the area. After that, Israeli vehicles headed towards Burin High school, where students were playing football, and arrested Ahmed Mohamed Abed al-Rahman ‘Imran (15). Israeli forces then withdrew and took the abovementioned persons to an unknown destination. Note: During the aforementioned day, Israeli forces conducted (6) incursions in the following areas and no arrests were reported: Bita village, southeast of Nablus and Madama village, south of the city; Halhoul, Yatta and al-Moreq villages in Hebron and al-‘Aroub refugee camp in Hebron as well. At approximately 01:00, Israeli forces moved into al-Am’ari refugee camp in al-Bireh city. They raided and searched a house belonging to Isma’il Fahmi ‘Abed and arrested him. At approximately 02:00, Israeli forces moved into Jenin camp, west of the city, and stationed in al-Sumran and al-Hadaf areas. They raided and searched houses from which they arrested Mohamed Othman Abu Qantah and Ramzy al-Qanirah. Mohamed ‘Othman’s mother, ‘Afaf Abu Qantah (59), said that at approximately 02:30, Israeli forces raided their house and locked all of them in one room. They then searched the upper floor and roof. At approximately 05:30, they arrested Mohamed and then withdrew from the house. At approximately 06:30, Israeli gunboats stationed offshore, northwest of Beit Lahia, north of the Gaza Strip, opened fire at Palestinian fishing boats sailing within one nautical mile. An Israeli gunboat approached a fishing boat, which was manned by Mahdi Mohamed Ibrahim Abu Riyalah (38) and his son, Nafiz (16), both of them are from al-Shati camp, west of Gaza City. Israeli navy forces obliged the fishermen two take off their clothes, jump into the sea and swim towards the gunboat. They also confiscated the fishing boat and fishing nets. Fishermen, who witnessed the incident, said that Israeli gunboats heavily opened fire at Palestinian fishing boats sailing within 5 nautical miles. The shooting incident concentrated at the fishing boat carrying the abovementioned fishermen, who attempted to flee to the east. When the fishermen were sailing within one nautical mile, they were forced to stop due to the heavy gunfire. They were then arrested and their fishing boat was confiscated. At approximately 11:30, Israeli forces moved into ‘Oreef village, south of Nablus. They raided and searched two houses from which they arrested Ahmed Mashhour Mohamed al-Safadi (16) and Mohamed Ahmed Abed al-Fatah Shehada (20). At approximately 00:50, Israeli forces moved into Deir Balout village, west of Salfit. They raided and searched a house belonging to Hamadah Abed al-Wahab Mohamed Abdullah (37), handcuffed him and took him to an unknown destination. At approximately 03:00, Israeli forces moved into Yatta village, south of Hebron, and stationed in the western side of the village. They raided and searched two houses from which they arrested Ziad ‘Oqab Nawaj’ah (40) and Fahd ‘Isaa Mohamed ‘Awad (33). Note: During the aforementioned day, Israeli forces conducted (4) incursions in the following areas and no arrests were reported: a;-Far’ah camp, south of Tubas; Sabsatyia village, northwest of Nablus; and Halhoul and Sureef villages in Hebron. At approximately 01:30, Israeli forces moved into Salem village, northeast of Nablus. They raided and searched houses and arrested Mos’ab ‘Akif Ishtaih (22). It should be noted that the arrested person is a former prisoner, who suffered from thyroid goitre, due to which he became unable to speak 3 times in the Israeli jails. Moreover, Mos’ab suffered from hypertension. Mos’ab was arrested on 23 July 2014 and was sentenced 16 months in prison. At approximately 06:30, Israeli forces accompanied with military vehicles moved about 100 meters away, east of al-Burij refugee camp in the central Gaza Strip. Israeli forces patrolled the area along the border fence before re-deployment. Following the Friday prayer, on 26 August 2016, dozens of Palestinians and Israeli and international human rights defenders organized protests against the annexation wall and settlement activities in Bil’in and Ni’lin villages, west of Ramallah, al-Nabi Saleh village, northwest of the city, and Kufor Qaddoum village, northeast of Qalqiliya. 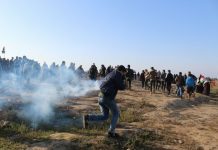 Israeli forces fired live bullets, rubber-coated metal bullets, sound bombs and tear gas canisters to disperse the protesters and chased them into the agricultural fields and between houses. As a result, many civilians suffered tear gas inhalation while others sustained bruises as Israeli soldiers beat them up. At approximately 01:00, on 30 August 2016, Israeli forces accompanied with a military bulldozer moved into Soud Valley, north of Dura village, southwest of Hebron. They stationed around a house belonging to Mohamed Abed al-Majeed ‘Amayrah (38) and then raided it. It should be noted that the abovementioned house was built on an area of 200 meters and there was a water well around it. Mohamed’s family consisting of his wife and their two girls lives in the house. Israeli forces planted explosives in the house walls and then took all the neighbourhoods 400 meters away from the targeted house and locked all of them in one house. At approximately 04:00, Israeli forces bombed the house. It should be noted that Mohammed has been arrested by Israeli forces on 02 July 2016, claiming that he carried out a shooting attack at a vehicle, which resulted then in the killing of a female settler. On 23 July 2016, Israeli forces handed an administrative demolition notice to the family, according to Regulation 119 of the Defence (Emergency) Regulations 1945. On Sunday, 14 august 2016, Israeli forces allowed the exportation of 13 tons of tomatoes, 12.2 tons of cucumber, 1.2 tons of eggplant, 7 tons of sweet potatoes, 7 tons of clothes and 0.5 tons of squash. On Monday, 15 August 2016, Israeli forces allowed the exportation of 30.6 tons of potatoes, 28.7 tons of cucumber, 9.5 tons of sweet potatoes and ton of cabbage. On Tuesday, 16 august 2016, Israeli forces allowed the exportation of 30.6 tons of tomatoes, 28.7 tons of cucumber, 9.5 tons of sweet potatoes and ton of cabbage. On Wednesday, 17 August 2016, Israeli forces allowed the exportation of 88 tons of iron scrap and 36 tons of aluminum scraps. On Thursday, 18 August 2016, Israeli forces allowed the exportation of 43.4 tons of tomatoes and 15.9 tons of cucumber. On Sunday, 21 August 2016, Israeli forces allowed the exportation of 6 tons of clothes and 25 tons of stationary. On Monday, 22 August 2016, Israeli forces allowed the exportation of 23 tons of tomatoes, 7.5 tons of cucumber, 5 tons of potatoes, 12 tons of furniture and 132 tons of iron scrap. On Wednesday, 24 August 2016, Israeli forces allowed the exportation of 132 tons of iron scrap. On Thursday, 25 August 2016, Israeli forces allowed the exportation of 57.8 tons of tomatoes, 8.3 tons of cucumber and 8.3 tons of potatoes. On Sunday, 28 August 2016, Israeli forces allowed the exportation of 6 tons of clothes and 16 tons of furniture. On Monday, 29 August 2016, Israeli forces allowed the exportation of 25 tons of iron scrap and 9 tons of vegetables. On Thursday, 25 August 2016, Israeli forces established 4 checkpoints at the southern entrances to Hebron Bani Na’im and al-Jalajel villages and al-Fawar refugee camp. On Friday, 26 August 2016, Israeli forces established 2 checkpoints at the Sothern entrance to Halhoul and southern entrance to al-Fawar refugee camp. On Saturday, 27 August 2016, Israeli forces established 3 checkpoints at Oyoun- Abu Saif road, west of Dora and the entrances to Deir Samet and Bani Na’im villages. On Sunday, 28 August 2016, Israeli forces established 3 checkpoints at the entrances to Beit Kahel and Bit Ommar villages and Farsh al-Hawa road. On Tuesday, 30 August 2016, Israeli forces established 2 checkpoints at the entrance to Beit Kahel village, and the entrance to al-Samou’ village. Ramallah: Israeli forces established (10) checkpoints all over the city. At approximately 17:20 on Friday August 2016, Israeli forces established a checkpoint between on ‘Atarah Bridge at the northern entrance to Birzeit village, north of Ramallah. At approximately 19:50, they established a similar checkpoint near “‘Ofra” settlement, northeast of the city. On Saturday, 27 August 2016, Israeli forces established 6 checkpoints at the following areas: the crossroad of Beit Our al-Fuqa village, southwest of Ramallah, the entrances to al-Nabi Saleh and Deir abu Mesh’al villages, northwest of the city, the intersection of ein Seniya village, north of Ramallah and the entrances to Ni’lin and Shaqbah villages, west of the city. At approximately 19:00 on Monday, 29 August 2016, Israeli forces established a checkpoint at the entrance to Beit Sira village, west of Ramallah. At approximately 14:00 on Tuesday, 30 August 2016, Israeli forces established a checkpoint at the entrance to Turmus’aya village, northeast of the city. At approximately 16:10 on Friday, 26 August 2016, Israeli forces established a checkpoint under the bridge of Azoun village at the road that links between Qalqiliya and Tulkarm. At approximately 19:30, they established a similar checkpoint at the entrance to Azoun village, east of Qalqiliya. At approximately 19:00 on Saturday, 27 August 2016, Israeli forces established a checkpoint at the entrance to Hijah village, east of Qalqiliyah. At approximately 18:30 on Tuesday 31 August 2016, Israeli forces established a checkpoint at the crossroad of Jeet village, northeast of Qalqiliyah. The soldiers closed the main street between Nablus and Qalqiliyah to hold a festival for the Israeli settlers. They also forced the cars to drive in a different street. This incident continued until 22:00. At approximately 18:00 on Saturday, 27 August 2016, Israeli forces established a checkpoint at the southern entrance to Bruqin village, west of Salfit. At approximately 13:00 on Friday, 26 August 2016, Israeli forces stationed at the entrance to al-Ibrahimi Mosque in the central Old City in Hebron, arrested Shefaa’ ‘Areif al-Atrash (22) from Qalqas neighborhood, south of the city, claiming that she attempted to stab an Israeli soldier. They took her to Kiryat Arba police center. At approximately 18:30 on Saturday, 27 August 2016, Israeli forces established a checkpoint at the entrance to Kafer Qud village, west of Jenin. The soldiers stopped the cars travelling in or out of the village and checked the passengers’ ID cards. When a car travelled by 4 civilians passed through the checkpoint, the soldiers stopped and searched it and then arrested the 4 civilians. The Israeli soldeirs confiscated the car, claiming that there was a hunting rifle inside it. Later, the Israeli forces removed the checkpoint and took the abovementiond arrested civilians to an unknown destination. The arrested civilians were identified as Taleb Hasnain Ahmed Yahyah (24), Tareq Hasan Yahya (25), Hussain Hassan Ahmed Yahyah (27) and his brother Yusuf (26). At approximately 19:00 on the same day, Israeli forces established a checkpoint at the entrance to Deir Abu Da’if village, southeast of Jenin. The soldiers stopped the cars travelling into or out of the village and checked the passengers’ ID cards. When a car travelled by 2 civilians passed through the abovementioned checkpoint, the soldiers stopped and searched it and then arrested the 2 civilians. They confiscated the car, claiming that there was a hunting rifle inside it. Later, the Israeli forces removed the checkpoint and took the abovementiond arrested civilians to an unknown destination. The arrested civilians were identified as Motaz Aqab Zakarnah from Jenin and Basem Fouad Salah Salamah from Faqu’ah village, north of the city. At approximately 02:00 on Saturday, 28 August 2016, Israeli forces established a checkpoint at the southern entrance to Hebron (Hejai Road) and then arrested Omer Khalil Abu Fedah (22), claiming to find a knife in his bag. He was then taken to an unknown destination. At approximately 16:00 on Thursday, 25 August 2016, Israeli forces moved into al-Thawri neighbourhood, south of the Old City in East Jerusalem. They raided and searched several houses after which they arrested Akram Khalil Hasounah (14) and Badi’ Gaith (19). At approximately 22:00, Israeli forces moved into Wadi Helwa neighbourhood in Silwan village, south of the Old City in East Jerusalem. They established a checkpoint at the entrance to the neighbourhood, stopped the cars and checked the passengers’ ID cards. The soldiers provoked two civilians while searching their car, causing verbal altercations between them. As a result, the soldiers heavily beat the two civilians with electric batons and then arrested them. The arrested civilians were identified as Mohammed Qara’in (19) and Shadi Ayman Amirah (20). Moreover, the Israeli forces attacked and beat Mahmud al-‘Abasi (22) when he was in front of his house in the neighbourhood. At approximately 06:00 on Sunday, 28 August 2016, Israeli moved into Qalendiah refugee camp, north of East Jerusalem. They raided and searched several houses after which they arrested Anas Ouda Ya’qub (19) and Samer Omer Mansour (24). At approximately 04:30 on Monday, 29 August 2016, Israeli forces moved into Ras al-‘Amoud neighbourhood, east of Jerusalem’s Old City. They raided and searched several houses after which they arrested 3 children namely Na’man Zeyad Faraj (16), Omer Ismail Shuaiki (16) and Ahmed Mazen al-Razem (17). On Saturday afternoon, 27 August 2016, Israeli forces accompanied with municipality crews moved into several neighbourhoods in Silwan village, south of the Old City in East Jerusalem. They handed demolition notices under the pretext of building without a licence. According to investigations conducted by a PCHR’s fieldworker and statements of eyewitnesses, municipality crews protected by Israeli forces moved into Wadi Helweh, Ein al-Lawah, Bier Ayoub, al-Bustan and Baten al-Hawa neighbourhoods in Silwan village and took photos of facilities. They raided and searched several facilities and handed demolition notices to their owners under the pretext of building without a licence while they demanded others to refer to the competent departments in the municipality. One of the owners was identified as Bahaa’ Adnan Zaytoun, who received a demolition notice for his house in “Hosh Zaytoun” in “Bier Ayoub” neighbourhood. The house is inhabited by 5 individuals (the parents, 2 children aged 5 and 3 years and a 3-day old baby). It should be noted the house was built 2 years ago while the family moved into it only few months ago. Moreover, the municipality crews handed a demolition notice to a facility built of wood and belong to Mohammed Zaytoun in Bier Ayoub neighbourhood. Mohammed started building the facility 2 weeks ago. The municipality crews also handed another notice to demolish fences surrounding a piece of land in the same neighbourhood. They ordered the family to lower the fence into one meter. Furthermore, Salah Kash’am received a demolition notice of his building in Baten al-Hawa neighbourhood. The 150-square-meter building was built in 1994 and comprised of 3 floors; where 5 families live in. The municipality crews handed ‘Arafat Abu al-Hamam a demolition notice of a mobile container and room used as stores in al-Lawzah neighbourhood. Around the same time, the municipality crews raided al-Bustan Set-in Tent, ordered to stop the repair works and remove the tiles under the pretext of repairing work without a licence. Two hours later, the Israeli forces again raided the tent to make sure the work stopped. Sheikh Mousa Oudah, Member of al-Bustan Neighbourhood Committee, said the tent was established in February 2009 after the municipality threatened to demolish al-Bustan neighbourhood in order to establish national gardens. At approximately 07:30 on Monday, 29 August 2016, Israeli bulldozers demolished 6 dwellings and 2 livestock and horse barns in al-Ma’azi community, east of Jaba’ village, north of Jerusalem. It should be mentioned that those dwellings used to shelter families comprised of 28 members, including 18 children, rendering them homeless. The Colonization and Wall Resistance Commission donated those dwellings after the Israeli forces demolished houses belonging to 15 families in the abovementioned community in August 2015. Those dwellings belong to Fatmah Saraiy’ah, Raed Saraiy’ah, Ahmed Saray’ah, Fahimah Barakat and Najeh Saray’ah. Around 150 individuals living in al-Ma’azi Community suffer from difficult life conditions. In addition to the homelessness life imposed on them by the Israeli forces, the inhabitants suffer to find potable water as each individual is forced to buy a small water tank that costs NIS 80 and meets their demand for several days. The Israeli forces also target their only source of living as they prevent their sheep to reach the grasslands. They also prevent giving young men in the Community work permits, resulting in prevalence of unemployment in the Community. At approximately 04:00 on Tuesday, 30 August 2016, Israeli bulldozers demolished a house in Sur Baher village, south of Jerusalem, belonging to Wasim ‘Atiyah under the pretext of building without a permit. Wasim said to a PCHR’s fieldworker that Israeli forces raided his house in the dawn, forced the family to leave. They allowed the family to take some furniture out, but then demolished the house on the rest. The bulldozers demolished the fence around the house and the main door. Wasim added the municipality bulldozers carried out the demolition without a prior warning. He also said that he moved along with his family comprised of his pregnant wife and 3 children aged between 4 to 8 years into his 120-square-meter house a year ago as the house cost him around NIS 400,000. It should be mentioned that he submitted the needed files to obtain a construction licence for his house, and the Municipality Court set the end of next October to hold a session to discuss the house licence. In the same context, Israeli municipality crews accompanied with Israeli forces raided Wad Yasoul neighbourhood in Silwan village, south of the Old City. They demolished 2 under-construction houses belonging to Eyad Nairoukh. Eyad started building the 2 houses of bricks on 11 August 2016, but was surprised with the demolition. They also demolished the fences around the abovementioned houses belonging to Aziz Barqan and Abed Shuwaiki, claiming that they were built without a licence. Eyad emphasized that the Israeli bulldozers demolished 2 under-construction houses built two weeks ago on an area of 160 square meters. He also mentioned that the municipality previously handed him a demolition notice on 25 August 2016, and he was surprised when the neighbours called to tell him about the demolition.